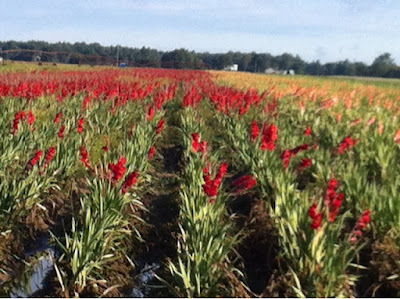 We live among many fields and most of those contain soybeans, field corn and an occasional hay field but the most eye catching is the Gladiolus. They are a beautiful site when in bloom. I learned today that Bronson has 1400 acres of Gladiolus causing it be known as "The Gladiolus Capital of the United States"